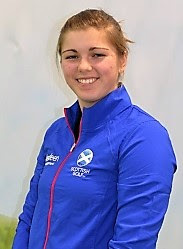 Hannah McCook from Grantown-on-Spey will take a one-shot lead into Sunday's final round of the Irish women’s open amateur stroke- play championship at County Louth Golf Club. Hannah, pictured, has an outstanding chance of pulling off a rare title double - recently she won the Welsh women's open amateur championship at Aberdovey. The gale-force wind which blew the first-round scores sky high on Friday had disappeared and Hannah was able to follow her opening seven-over-par 81 with a five-under 69 today. McCook had an eagle at the par-5 third holes as well as a bag of six birdies. “I hit it into 10 feet on the 2nd hole and just missed for eagle, so following it up by hitting it close again on the 3rd and managing to hole that one was nice,” explained the Stirling University graduate. “I hit it really close again then on 4 and 5 to go 5 under through five holes and was thinking to myself, 'OK Hannah, Calm down now! '” Following a bogey on the 387yard 8th, McCook birdied the 9th, 13th and 14th to get back to 5 under and equal the best score of the day alongside Anna Foster (Elm Park). “The birdies on 13 and 14 were both down to really good iron shots, I hit it into a couple feet both times. Winning last week in Wales has given me a huge boost so I am just riding the wave now and we will see what happens,” said Hannah.